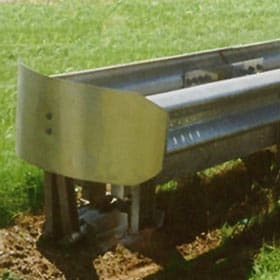 The Brakemaster 350 is designed to shield guardrail ends at wide median and roadside sites with adequate clear zones. The system consists of a framework of w-beam steel guardrail panels which move rearward during head-on impacts . The system also safely redirects vehicles during side impacts. The Brakemaster 350 provides superior bidirectional protection and does not require a concrete anchor or pad, making it fast and easy to install. It meets NCHRP 350, Test Level 3 as a redirective, gating end treatment. As a gating system, the Brakemaster 350 requires adequate clear zone.